This is a variation on a recipe I found in "Eat Shrink and Be Merry" by Janet and Greta Podleski. Their original recipe is for salmon skewers (called Skewer Always on my Mind) and has a couple more ingredients that I didn't have on hand. I used a big Salmon fillet and let the marinade sit on it for half an hour before broiling. Combine all marinade ingredients in a bowl. Mix well. Place salmon on a large plate. Pour marinade on top. Let sit for a half hour in the fridge. Pre-heat broiler to high setting. Place salmon onto a baking sheet. Broil for 15 minutes (approximate), probably more depending on the thickness of your salmon fillet. Keep checking to see that the salmon is cooked through at the thickest part (use a fork to flake). Be careful not to overcook or the salmon will become dry. I broil in my oven, so I made sure to put it in the centre of the oven so the top doesn't burn. Oh wow, look at that tasty crust...looks great :D ! 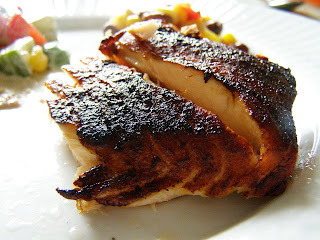 I have been soooo craving salmon, this looks wonderful! GREAT flavor combination on the marinade!! The marinade sounds totally awesome. Your fish looks so nice and flaky good! Next time I get a salmon, I'm trying this! That marinade sounds so very tasty. I puffy heart salmon and this looks so good! I love all the ingredients in this one--a great combo of flavors--yum! MMMMMMMMMMMMM! Love the look of your salmon. I don't know why I don't think to let it sit a bit before cooking it. Thanks for the tip!